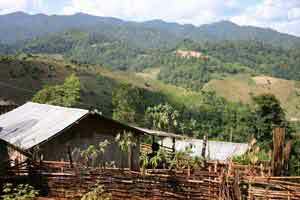 Northern Thailand offers a rich cultural experience and beautiful landscaping. Although it's hard to get away from the tourist crowds anywhere in Thailand, you'll find the northern part of the country more relaxed and mellow than the touristy south. The food in the north is also some of the best you will find. Begin your trip by heading to the popular town of Chiang Mai. There are overnight trains from Bangkok or it is possible to fly if you are short on time. Chiang Mai is a popular place to spend a few nights. You can set up a trek through your hotel or hostel and spend anywhere from one day to several weeks hiking through the beautiful countryside. From there you can head to Chiang Rai and the area known as the Golden Triangle. Many people enjoy visiting Elephant Sanctuaries or participating in elephant treks during their trip to the north. Inquire in advance to make sure you understand the standard of care provided to the elephants at your chosen facility. 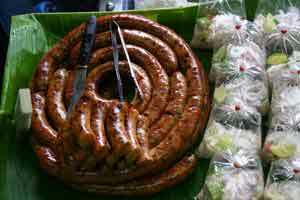 From there you can travel to Lampang, which has a rich history in trade. There are temples and many sights of interesting worth visiting. Continue heading south and spend some time in the small city of Sukhothai. This area is about 420 km from Bangkok and offers ruins that are worth exploring as well as the ancient city of Sukhothai. There are many different beaches worth exploring in Southern Thailand. In particular, there is a distinct and different atmosphere and climate between the eastern and western coasts. Consider what your expectations are before planning your trip. 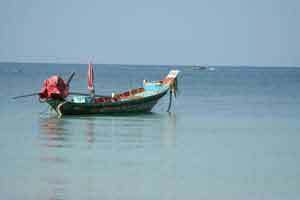 Many people head from Bangkok down to either Koh Samui, Koh Phangan and Koh Tao. These islands each offer their own vibe. It's possible to visit all three, but if you're short on time pick the one that offers the most of what you're looking for. From there you can head from the east coast to the west coast and visit the famous Phuket. 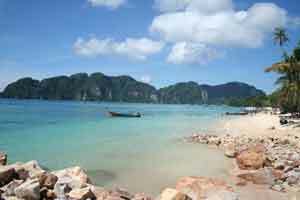 Many people enjoy the party atmosphere of this area and base themselves in Phuket with day trips to other beaches. If you want to experience more of what Thailand has to offer, spend some time in Phuket and then travel independently to Koh Phi Phi. From there you can travel to Krabi and Railay Beach. Many people travel on from there into Malaysia. If you're headed back to Bangkok a flight may be your best option. There are a variety of airports in Southern Thailand that offer affordable flights back to Bangkok. There are also VIP bus options available but the trip can be long and tiring. This is your cheapest option, however. Many people find themselves in Bangkok with some time to explore. If you've seen a lot of what Bangkok has to offer, there are some great day trips that are worth experiences as well. Four popular day trips include Kanchanaburi, Aytthaya, Hua Hin, and Damnoen Saduak Floating Market. Kanchanaburi is the capital of Kanchanaburi Province. There you will find the Burma Railway (also referred to as the Death Railway) bridge. It was built by Allied POWs during WWII and today there is a memorial and two museums nearby which commemorate those who died during that time. Elsewhere in the Kanchanaburi Province you will find forests and caves to explore, as well as beautiful waterfalls. Ayutthaya was an ancient capital city, but today is a modern Thai city that offers many archeological wonders. Many of the ruins are from old temples and palaces. In 1991 it became a UNESCO World Heritage Site and remains a popular day trip for visitors due to its close proximity to Bangkok. Hua Hin is a laid back beach town that has a relaxed and family friendly atmosphere. It does not offer much for party goers but the small town charm is what attracts many visitors. It's a nice place to get away and chill out in a comfortable setting. Damnoen Saduak Floating Market is a popular tourist destination as a floating market. 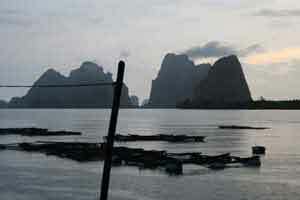 It's listed in most of the guidebooks and is therefore one of the more popular side trips from Bangkok. It's a great place to see the wooden boats selling their goods of fruits and vegetables. It's a colorful and festive environment and is conveniently only 100 km from Bangkok. Many people reach it as part of a package tour.